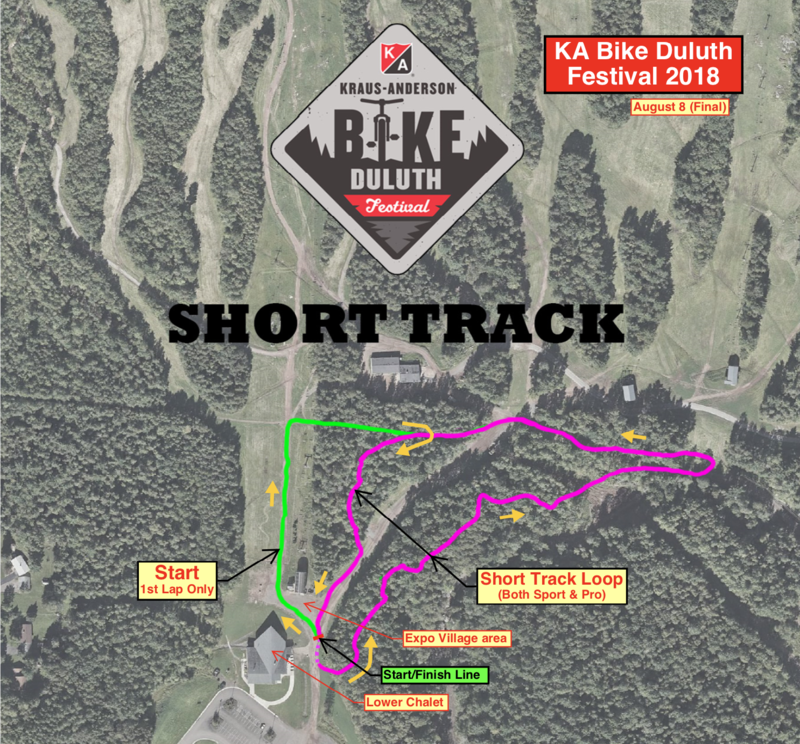 Check out our event schedule for the Kraus-Anderson Bike Duluth Festival 2019! TIMES SUBJECT TO CHANGE. STAY TUNED FOR MORE DETAILS. Stop by Spirit Mountain to pick up your race packet or to register for Saturday’s races. Day-of registration and packet pickup are available, but participants are encouraged to pick up packets on Friday. While you’re there, pre-ride the trails to give you an edge on Saturday. Pre-ride the trails for Saturday’s mountain bike races and enjoy food and drink at Spirit Mountain’s Grand Avenue Chalet. The Opening Ceremony introduces Saturday’s main events and give further race updates. Booths from Trek Bikes, Ski Hut, St. Luke’s Orthopedic & Sports Medicine, Kraus-Anderson, Spirit Mountain, and more. Beverages from local craft breweries and food from Spirit Mountain. Product demos from Trek, Specialized, Continental Ski and Bike, Santa Cruz and SRAM. Take a bike out for a test ride in the Skills Park. Location – Starts at Spirit Mountain Start – TBD This sweet locally guided traverse event will take you through Duluth’s epic trail system and offers spectacular vistas of the St. Louis River and much more! Mountain bikes required. KA20 (Short) This part gravel, part railroad grade ride is an easy and fun course that has thrilling turns, scenic views of the historic railroads and even a tunnel to cruise through. KA35 (Long) If you find yourself on the short ride and would like a bit more of a challenge, riders will have the chance to up their skill level on this mountainous climb through some of the most incredible local trails. Want more of a challenge? Test your speed and skill against some of the area’s fastest racers in a short track format. Same course as the recreational event, just faster competition. This ride will be 20 minutes +1 lap. They are very fun to watch. Spectators and participants are welcome. Get a quick taste of some of the XC Trails and challenge yourself to see if you can keep up with the competition in this short and fast paced event. This ride will be 20 minutes +1 lap. They are very fun to watch. Spectators and participants are welcome. A four-stage race aimed at experienced enduro riders on capable bikes. Long Enduro Stages 1 and 2 will be pedal up. Long Enduro 3 and 4 will be lift assisted. This year the courses will not be the exact same as the Short Enduro. We’ve got a mix of some classic trails to go along with something that you haven’t seen before. Course description and map will be revealed a week before race day. A two-stage race aimed at riders new to enduro racing and can be completed using any type of self-powered mountain bike. The two stages will utilize their own specific courses this year and stay a bit more tame than they have been in the past few years. Short Enduro Stages 1 will be pedal up. Short Enduro 3 will be lift assisted. Course descriptions and map will be revealed the week before the race. A free event to participate in throughout the day. A very mellow path will wind down the base of Spirit Mountain and is aimed at the youngest of young riders! This course is all about FUN and developing bike handling skills. Spend some time here with your little one getting them introduced to the thrill of gravity! The race will be open to riders who have a bit of bike handling skills regardless of their age. All riders will be racing down a Green level Trail. There will be four age categories, male/female 5-9 and male/female 10-15. This race is geared towards the young, up and coming downhill riders that are the riders and racers of the future. T-Shirts are available while supplies last. Items provided by our sponsors and local businesses, from bike gear to brewery swag. Browse at your leisure and be sure to check back in case you get outbid! Join the Kraus-Anderson Bike Duluth Festival committee in celebrating and recognizing this year’s race winners.